The Student Center buzzed with activity Thursday as both the campus bookstore’s Student Day and the Center for Leadership and Development’s Latino Hispanic Heritage Celebration went on at the same time. 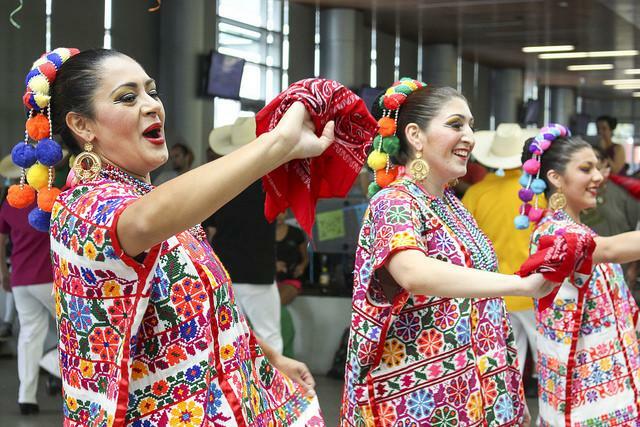 CL&D employee Frankie Johnson worked together with student assistants to organize the Latino Hispanic Heritage Celebration, which included dance workshops, trivia contests and live performances. Johnson said the event was meant to celebrate the culture, but also to enlighten. “We’re trying to teach students as well as bring them together,” Johnson said. In an effort to bring those students, vendors were set up and cultural food, burritos, tacos and carne asada was offered. Johnson credited her student assistants and ARC SAGE’s for their assistance in the day’s coordination. “They help me put this together, and it’s really exciting to see what they do,” she said. Students Briana Runyan, undecided, and Anthony White, a cultural anthropology major, were dance partners during a salsa workshop led by student life adviser Juan Miguel Blanco. White, a member of ARC’s dance company, enjoyed the dancing. “I’d never learned to salsa before,” White said. The bookstore’s Student Day event is part of a yearly promotion for student participation and volunteerism, as well as charity. This year’s chosen charity was Big Brothers Big Sisters of Sacramento. In addition to donations, all proceeds from the event, which featured food, drinks and merchandise, will also go to the charity. Students had the opportunity to participate in games to win free items, such as book bags, Scantrons and other school supplies. Additionally, all bookstore merchandise was 25% off for the entire day. Hudgens said over a thousand hot dogs were sold as of 1 p.m., and she was happy with the turnout of students. Be the first to comment on "Simultaneous events make for a fun, busy day"